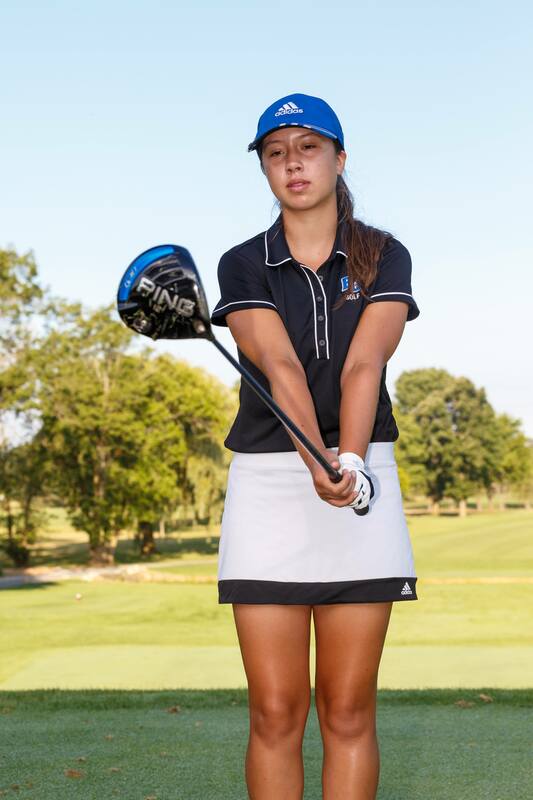 When it comes to setting goals, Brookfield Central junior golf Emily Balding doesn't fool around. 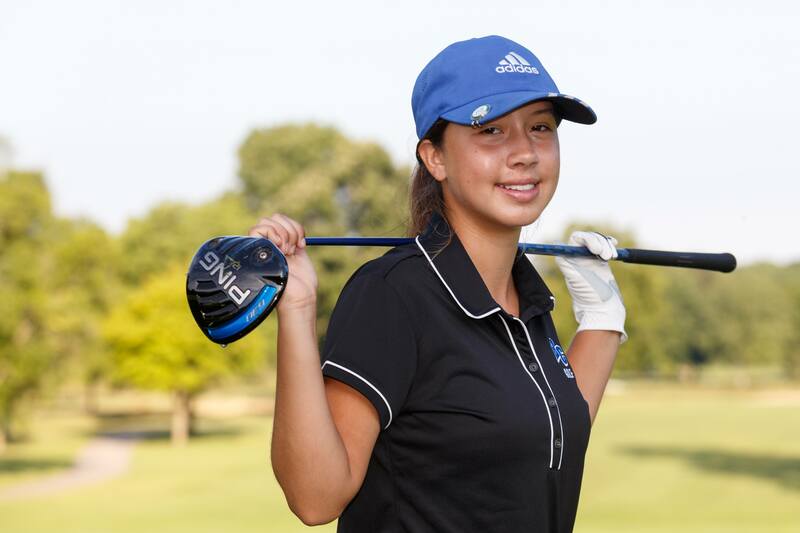 Last season Balding, who was only a sophomore, set her goal as being the best golfer in the Greater Metro Conference. "Definitely that was a goal of mine last year, so when it happened, it wasn't really a surprise because that's what I was working for," the soft-spoken Balding said. She went on and finished tied for 21st at the WIAA State Meet, shooting an 85 and an 81 for a 166 total. "She hit the ground running in our program," veteran coach Brian Scrobel said. "Her freshman and sophomore years were very successful and she's about ready to have a successful junior year." So, Emily, what's on the agenda this year? "I would like to be the Player of the Year again," she said, never hesitating. "I am also hoping my team will qualify for state and ideally I would like to play well at state, maybe take Top 10." That is a realistic goal, since the Lancers also return juniors Emma Whitefield, a first-team selection last year, and second-team selections, Lexi Romero and Sophia Sun, both juniors. "Emily is very quiet, very calculated, goal driven," Scrobel said. "She has those goals and works very hard. I've had very few golfers who work as hard as she has. She has those goals." Emily's parents introduced her to golf when she was 9-years old. She took a lot of lessons and she eventually took a liking to the game. "I liked it a little bit," she said. "It was a little frustrating for me at first, but I enjoyed it when I hit a good one." She began playing in tournaments when she was 11 and the summer before her freshman year she played in her first 18-hole tournament. But Emily had a decision to make going into her freshman year. "I love to swim," she said. "I swam competitively for nine years, so I had to decide between swimming and golf. I quit swimming and decided I was going to play golf. I was a lot better at it than swimming, I think. I quit swimming to play golf because they are at the same time (fall season)." Scrobel recalled the first time he heard of Emily was at an open house atWisconsin Hills Middle School. "Her parents came up to me and introduced themselves," he said. "Her father talked about how his daughters are very active in golf and I told him a little bit about our program. "I told him it was his lucky day he came to this school, but he said it wasn't luck. He called ahead and some friends in the area told him about the program and he chose to come to Brookfield Central. Emily was in our junior program (Jr. Lancer Academy) with a lot of success (as an eighth-grader)." Scrobel was immediately impressed with Emily's play. You can have all the skill in the world, but if you don’t have that passion, you’re never going to have that drive to want to get better. "Her ability to hit the ball. Her ball striking, her putting, just her passion for the game, jumped out right away," he said. Balding's confidence also shows in her leadership skills. "I think I'm going to be captain this year and I feel like I'm a leader," she said. "I definitely play more golf than the other girls. I like to boost their confidence and encourage them a lot. Sometimes they are not confident in their games and I try to remind them that they are very good golfers and they should be confident. "I practice a lot every day - I work hard to improve my game - so they'll see that and hopefully they'll practice hard too." Scrobel also spoke about Emily's ability to lead. "There are two things about her," he said. "Her confidence in herself allows her to have more of a vocal leadership role in the team. The other one is she does everything we ask and she works very hard. She's very diligent for her golf lessons. She signs up for a lot of tournaments. I want everyone to see our most successful golfer has done A, B and C to be good." Despite her success, Emily is far from perfect. "My strength is my short game, definitely, especially my putting," she said. "But I have to work on the mental part of my game; staying confident. If you have a bad shot, you have to remind yourself to stay positive." Off the tee Emily wants to keep the ball in the fairway and hit it solid. "I think a 220 drive is my best," she said. "But I think, 200-208 is a good job." Scrobel smiled when I asked about her strengths. "I'm not trying to avoid the question," he said. "But the best part of her game is her all-around game. She doesn't hit it real far, but she hits it far enough. Her irons, she plays very well, her short game is always there when she needs it. When she is in the zone, she really has a strong putter. She putts from all over the green." So what's her next step? "To get to the next level she needs to develop her course management," Scrobel said. "Her ability to play well even though she is not hitting the ball really well. To have that mental toughness to get through some situations like that. She's already shown growth in those areas and I can't see anything she needs to do to continue to make those strides." Emily says she does not feel any pressure to play well because she is the Lancers' top golfer. "I don't feel any pressure. It's just a positive thing (to build on)," she said. "The best way to support my team and help them do well is to do my best. Sometimes I do get caught up in thinking I have to make this putt for the team, but usually I play better when I just try to do my best. and that helps the team in return." Scrobel then talked about what makes Emily a true success. "Passion drives success in any action of your life," he said. "For an athlete - whether its basketball, soccer or golf - passion inside helps you want to practice, it's what drives you. You can have all the skill in the world, but if you don't have that passion, you're never going to have that drive to want to get better. Passion is the key." Emily talks about winning the GMC Championship again and looks forward to another year with her teammates. "We're like sisters," she said. "We just love each other." Scrobel pointed out that Emily is more than just the team's best golfer. "She's kind, caring, compassionate, she truly cares about her teammates," he said. "She's funny. People enjoy being around her. She's just a great kid. "We're fortunate to have her in our program." FAVORITE FOOD: Strawberries. Meal: Stir fry. FAVORITE CLASS: Spanish. Born in Peru and mom is from Peru. FAVORITE PLACE YOU VISITED: Amazon Rain Forrest in Peru. WHAT WOULD YOU LIKE TO DO IN THE FUTURE? Keep playing golf through my life. Might want to be a doctor.